FOR more than two decades, Australia has locked up people who arrive here fleeing persecution—sometimes briefly, sometimes for years. In They Cannot Take the Sky those people tell their stories, in their own words. Speaking from inside detention on Manus Island and Nauru, or from within the Australian community after their release, the narrators reveal not only their extraordinary journeys and their daily struggles, but also their meditations on love, death, hope and injustice. Their candid testimonies are at times shocking and hilarious, surprising and devastating. They are witnesses from the edge of human experience. The book won the Australian Human Rights Commission Media Award for 2017. Buy it now or buy the audio book produced by Audible and read by Omar Musa and Nakkiah Lui. I travelled to Manus Island to meet and interview several men whose stories appear in this book – and who remain in detention there. 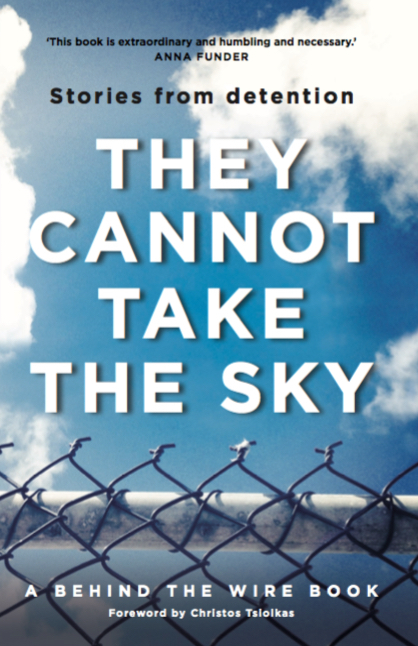 They Cannot Take the Sky is published by Allen & Unwin and was co-edited by me and André Dao, with support from Angelica Neville, Sienna Merope and Dana Affleck at Behind the Wire. In his foreword, novelist Christos Tsiolkas describes it this way: “a great and powerful chorus that sings the possibility of a hope that Australia has been denying itself”. Below, you can watch the book trailer, which features Behrouz Boochani, a Kurdish journalist currently detained on Manus Island. His is the opening story in the book, and we drew the book’s title from his words.